After 50 years old, it becomes more difficult for women to absorb nutrients, vitamins and minerals through their digestive track. For that reason, women over 50 need to pay close attention to how they supplement on a daily basis, in order to make sure they get everything their body needs to function properly. Vitamin D is an essential element helping the body to absorb calcium. As such, it supports bone health and fights against osteoporosis, particularly important for post-menopausal women who are most prone to the bone wasting condition. Vitamin D3 also contributes to a healthy immune system. Vitamin D3 is the natural form of vitamin D the body usually makes from sunlight. In the UK, it is particularly recommended to supplement with Vitamin D3 during late autumn, winter and early spring, when we do not get enough sunlight during the day. The NHS advises a daily Vitamin D dosage of 10μg, which is exactly the amount contained in one serving of Nature’s Aid Women’s 50+ Multivitamins and Minerals. Calcium actively contributes to keeping bones strong and healthy. After 50, oestrogen levels decrease and affect bone density, putting women more at risk of developing osteoporosis. Although the recommended daily amount of calcium for women over 50 is 1200mg, Nature’s Aid Women’s 50+ Multivitamins and Minerals only contains 50mg. While this seems low, most experts agree that it should be easy to get enough calcium from your diet, so be sure to include plenty of dairy and leafy greens. Vitamin K2 is another strong supporter of bone health. It is also an essential nutrient for blood clotting and could prevent tooth decay and chronic diseases such as heart diseases. As it is mainly found in fermented foods, we tend not to eat enough Vitamin K2 in our Western diets. Vitamin E encompasses several fat-soluble elements bearing antioxidant properties. It helps to maintain healthy skin and eyes and contributes to a strong immune system. In food, Vitamin E is mainly found in vegetable oils (such as olive oil), wheatgerm and nuts. Zinc is a mineral essentially found in meat and seafood. It contributes to optimum functioning of the immune system, vision, cognition, and normal carbohydrate metabolism. Studies have suggested post-menopausal women are more likely to have a zinc deficiency. It is thus essential for this mineral to be present in a daily multivitamin supplement for women over 50. The daily recommended intake of zinc is 8mg, just under the dosage contained in one serving of Nature’s Aid Women’s 50+ Multivitamins and Minerals. In Nature’s Aid Women’s 50+ Multivitamins and Minerals, B Vitamins are present in the form of thiamin (B1), riboflavin (B2), niacin (B3), vitamin B6, folic acid, and vitamin B12. B vitamins support the normal function of the nervous system, the normal function of the heart, and increase our metabolism and levels of energy. Vitamin B12 is particularly important to support those functions, and it is paramount for women over 50 to supplement it as it becomes harder to absorb it from food as we age. Nature’s Aid 50+ Multi-Vitamins and Minerals includes 10mcg of B12, generously over the 1.5mcg daily recommended amount for men and women under 65. Note that the NHS says taking less than 2mg (2,000mcg) daily is unlikely to cause any harm. Biotin is particularly useful to prevent brittle nails, as well as to support normal hair and skin. Magnesium plays a key part in preventing bones from weakening, supporting a healthy immune system and regulating blood pressure. The daily recommended amount of magnesium for a woman over 50 is 270mg, most of it easy to get from a balanced and healthy diet. 100mg as in Nature’s Aid 50+ Multi-Vitamins and Minerals is a fair dosage for a multivitamin pill to supplement what we could be lacking from our foods. – Siberian ginseng: potent plant known for its anti-inflammatory and stress reduction properties. – Bamboo Silica: contains 70% silica; has anti-aging properties and contributes to the strength of hair, nails and bones. – Soya Isoflavones: extracted from soybeans, promote heart and bone health in women who are past menopause. – Green tea: a potent antioxidant. – Acai powder: rich in calcium, iron, and vitamin E.
– Sage extract: enhance digestive track activity. The presence of these superfoods brings an extra health kick to the supplement, but each one is present in small amounts. As such, they will not significantly alter your daily intake of vitamins and cannot be considered as a primary ingredient of the blend. 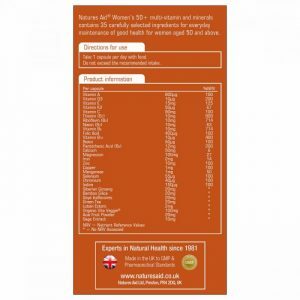 Nature’s Aid Women’s 50+ Multivitamins and Minerals is suitable for vegans. It is manufactured in the UK to GMP standards. Nature’s Aid is an established and respected company in the UK supplement industry. 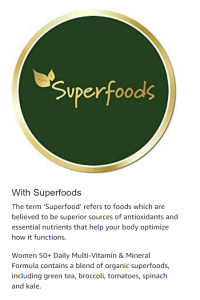 The addition of Superfoods provides an interesting addition of nutrients and antioxidants. The tablets are gluten, GM, yeast, wheat, dairy, lactose, nuts, salt and sugar-free. Strengthens the bones and fights osteoporosis. The smell of the capsules is a bit strong. Can cause stomach pains if not taken with food. At the time of writing, there are very few customer reviews available. There are no reported significant side effects linked to the use of Nature’s Aid Women’s 50+ Multivitamins and Minerals. However, due to the presence of superfoods like Siberian ginseng, you are advised to check with your GP if this product is right for you. This supplement contains iron, which can be harmful if taken by children. People with a heart condition are invited to talk to their GP before taking Nature’s Aid Women’s 50+ Multivitamins and Minerals as Siberian ginseng can cause a pounding heart, irregular heartbeat or an increased blood pressure. Take one capsule a day with food. Do not exceed the recommended dosage of one capsule every day. It is not necessary to use another general multivitamin supplement while taking Nature’s Aid Women’s 50+ Multivitamins and Minerals. Users of Nature’s Aid Women’s 50+ Multivitamins and Minerals have reported increased energy levels and a tendency to not fall ill as often as usual while taking Nature’s Aid Women’s 50+ Multivitamins and Minerals. To see tangible results, you will however need to take Nature’s Aid Women’s 50+ Multivitamins and Minerals every day for at least one month. 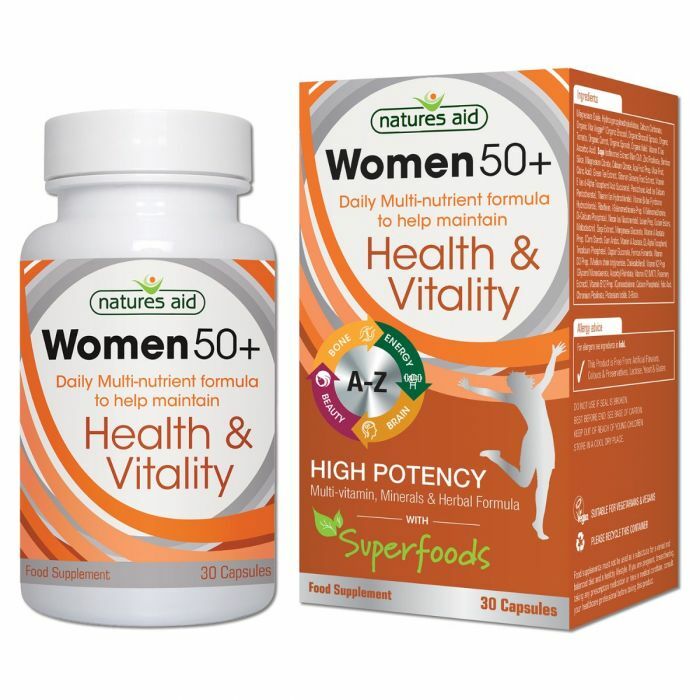 Nature’s Aid Women’s 50+ Multivitamins and Minerals is a well formulated, natural supplement for women over the age of 50. We love the added superfoods for an extra pinch of nutrients and antioxidants we tend to lack in our daily diets. It is a little bit more expensive than other multivitamin supplements available in the UK, but the added quality potentially justifies the difference. Overall, it’s a thumbs up from us for this formula. Nature’s Aid Women’s 50+ Multivitamins and Minerals is available from the Nature’s Aid website, Amazon UK and Holland and Barrett stores across the country.